Within 250 miles of Plano, IL. Two Day Swim Camp! Sign up for one or BOTH sessions for your age group! Participants ages 11 and under will develop stronger freestyle races. On Saturday they will work on building efficient and powerful freestyle habits. Then on Sunday, they will work on fast flip turns, underwater dolphin kicking, and finishes. Athletes ages 12 and older will be working on explosive starts, underwater dolphin kicking, and breakouts on Saturday. Then Sunday the focus of their session will be on the common, elite technique between freestyle and backstroke. Your clinicians for this camp will be two-time Olympian and world-renowned coach, Brett Hawke and 2016 Olympian in both open water AND pool swimming, Jordan Wilimovsky! Sign up today! Brett and Jordan will lead 4 sessions, two for each age group. Freestyle is the most technical stroke and it is also the stroke that you swim more than any other. Creating good freestyle habits NOW will not only help your swimmer race faster, but it will also help prevent injury in the future. 2016 Olympian in the 10k and 1500 freestyles, Jordan Wilimovsky will be in the water leading participants through each part of the freestyle stroke and Brett Hawke will teach specific drills to help them create good habits and deepen their understanding of fast and efficient freestyle technique. BODYLINE: Your freestyle will never be fast without a strong bodyline. Your swimmer will renforce good posture and engage their core to have a strong foundation for a faster freestyle. KICK: Become a stronger and faster kicker through learning about both the technique and timing of each kick from two Olympians. PULL: The best swimmers in the world utilize an early vertical forearm to put immediate pressure back on the water. Brett and Jordan will also teach swimmers how to get maximum extension and a powerful finish! Learn new drills and exercises to get more power out of every stroke! BREATH: All swimmers know to keep one goggle in and one goggle out when they take a breath, but do they know when and how long to breathe? Brett and Jordan will show your swimmer how to make each breath more efficient for faster freestyle racing no matter what distance. The start is the most athletic and explosive movement that a swimmer does in a race. Executing the proper start with a smooth transition into the underwater dolphin kick followed by a clean breakout takes precision of technique and timing. At this session, Olympians Jordan Wilimovsky and Brett Hawke will work with swimmers to execute a more explosive start, underwater dolphin, and breakout to become a more powerful athlete and a faster racer. 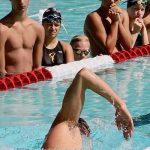 STARTS: How you set up on the block including proper hand and foot placement can allow your swimmer to launch themselves forward with a lot of explosive power. Brett and Jordan will work with each swimmer to find their best position on the block as well as how to launch their body forward into a tight streamline and enter through a small hole. UNDERWATER DOLPHIN KICKING: Many swimmer's don't know this, but you shouldn't begin dolphin kicking as soon as possible after the start or turn. Swimmers should push off in a tight streamline, then begin dolphin kicking after maximizing the speed of the pushoff. As a swimmer begins to kick, they should start bigger and slower, then become smaller and faster as they go. Brett and Jordan will work with the participants at this session to not only have the proper technique, but also the proper strategy to get the most out of their underwater dolphin kicking! BREAKOUT: Practice techniques to help your swimmer improve how they carry momentum from start, into the underwater dolphin kicks, and then to the breakout by timing the first stroke and staying streamlined. Your swimmer will practice keeping their head down and core engaged and it'll make a big difference in their breakout! Races are often won and lost because of the quality of turns, underwater dolphin kicking, and finishes of the competitors. Many people don't realize this, but the push-off and streamline from the wall after a turn SHOULD BE the fastest a swimmer will go while in the water other than the streamline after a dive. Even elite level, swimmers often add in extra movements on their turns and finishes that slow them down and even cause them to lose races that they could have won. At these sessions, elite clinicians and Olympians Brett Hawke and Jordan Wilimovsky will work with each participant to maintain their momentum at these key points in a race. FLIP TURNS: Your swimmer will learn how to carry their momentum through the turn to get in and out of every wall faster. Every participant will work on accelerating into the wall with long strokes and then using their core and arms to get through the turn. They'll practice planting their feet on the wall for a powerful pushoff in the perfect streamline. Brett and Jordan will give the swimmers drills and exercises to help them master this athletic skill now as well as in the future! STREAMLINES: A proper streamline is so much more than just putting your arms together over your head! Participants in this session will work with Olympians Brett Hawke and Jordan Wilimovsky to engage their whole body from fingertips to toe tips for the tightest streamline possible! The streamline after the start and every turn is the fastest a swimmer is ever moving in a race! Don't waste it! UNDERWATER DOLPHIN KICKING: The not-so-secret weapon of elite level swimmers is their underwater dolphin kick. The fastest swimmers in the world are faster underwater than on the surface and they utilize this skill. Jordan Wilimovsky and Brett Hawke will teach your swimmer how to unlock the speed and power of their underwater dolphin kick to generate more speed leading into their breakout. BREAKOUTS: Many swimmers lose momentum in the breakout by breaking their streamline and lifting their head. This creates drag which slows them down! Work with Brett and Jordan to maintain a streamlined body position as your swimmer takes the first stroke while keeping their head down and arm long. Maintaining the momentum after the dophin kicks is a key to racing fast! There are a lot of complexities behind the long axis strokes including a strong body line, powerful but balanced rotation, an efficient kick, and long arm pull. Working on these two strokes together greatly improves a swimmer's understanding and deepens their awareness so that they can race faster. Work with Jordan Wilmovsky to reinforce strong techniques and create more distance per stroke in freestyle and backstroke at this session. FREESTYLE: Participants will reinforce the muscle activations necessary to hold a straight and solid body line so that they can cut through the water with less drag. Practice keeping a still and low head position (especially during the breath!) while driving a strong flutter kick. Brett and Jordan will also work with participants how to get an early and powerful press backwards on the water in the arm pull to get more out of every stroke. From the 50 to the mile, your swimmer will improve on skills that will allow them to drop time in every freestyle race. BACKSTROKE: Engaging your core not only allows you to swim stronger, but it also allows you to hold the proper body position. Brett and Jordan will help swimmers learn the importance of rotation and how to use it to their advantage for more power in each stroke. The arm pull in backstroke should press the water all the way through using the whole arm to achieve maximum propulsion. Backstrokers are often the fastest kickers on their teams, find out why and learn to have a stronger kick! Swimmers and parents are invited to ask Brett and Jordan questions during a Q&A session. Gain insight into their training regimen, diet and nutrition, and recovery tactics. Observe Jordan swim at full speed and demonstrate a progression of perfectly executed drills to achieve powerful, efficient and fast swimming. Take a photo while wearing Brett and Jordan's medals, get autographs, and a gift from TYR Sport!